Republican Gov. Rick Snyder on Wednesday backed the extension of Medicaid coverage to 470,000 residents under the Obama administration's health care overhaul, saying it is the right thing to do despite resistance from his own party that controls the Legislature. 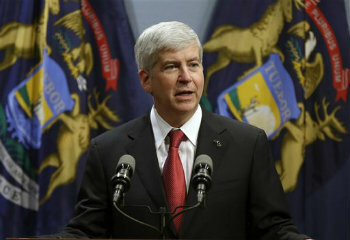 LANSING, Mich. (AP) — Republican Gov. Rick Snyder on Wednesday backed the extension of Medicaid coverage to 470,000 residents under the Obama administration’s health care overhaul, saying it is the right thing to do despite resistance from his own party that controls the Legislature.